Sometimes, Tehillim doesn’t seem to work. You beg others to daven with you, and you cry harder than you imagined possible into siddurim and Sifrei Tehillim of all shapes and sizes, and you beg and you plead...and then within 24 hours, your beloved Nana, the matriarch of your family and a light in your life, leaves the world. It’s been 11 months, and the pain has not subsided. It’s been 11 months of not being able to look at pictures. Of searching for her clothing just to find a smell, a hint of what was...of what I had, but didn’t realize it while I had it. But I will NOT stop saying Tehillim. I will not lose faith in the world in which Hashem has placed us, and neither should you. As I’m getting older, I can see the incredible pain and anguish that many go through in this world, and ignoring it for the sake of naivety is getting harder. It would be so easy to get stuck in the negatives of the world. The stabbings that are going on—people dying for NO reason because of someone’s NON-EXISTENT CAUSE that is somehow still justified by the world! But we—we still daven. Children getting sick who haven’t had a chance to see the world at its fullest, who experience more in 3 days than some of us experience in years, or even our entire lives. Why daven when there is so much suffering? So much pain? So much anguish? Why daven when I can’t even hear a physical word of response? The kisses from Hashem—you know the ones! THINGS IN LIFE ARE HARD. GETTING STUCK IN THE NEGATIVE?! THAT’S HARDER. It’s hard, when after all that Tehillim, my Nana has yet to return from the dead, to hug me and tell me everything WILL BE OKAY. Yet somehow...I know she is. Somehow, deep down, I know that what my Nana wants is for me to keep davening. To follow in her footsteps and see the good within every person. To LISTEN, and actually HEAR. To LOOK, and actually SEE. Make up with your loved ones. *Please say Tehillim for Miriam bas Gittel, may her special, holy neshama have an Aliya. In addition—and even more so—please take a moment to say Tehillim for LEORA RACHEL b-s CHAYA RAIZEL—a little ten year old girl who is dealing with a lot more than she should be. May Hashem give her a complete refuah shelaima. May we all be zoche to see Mashiach, and until then, see the good and the positive in every moment, no matter how strong the negative may seem. is 20 years old and from Woodmere, New York. She is the founder and singer-songwriter behind the band “8th Note”. 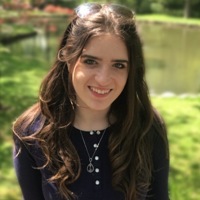 She works as a fashion stylist in a clothing store and volunteers for NCSY on the West Coast, while getting her degree in Business. Her goal is to bring Jews together, and closer to Hashem, through music and Torah. In her free time, Emmi plays music, goes horseback riding, and learns Chassidus from Rav Moshe Weinberger.